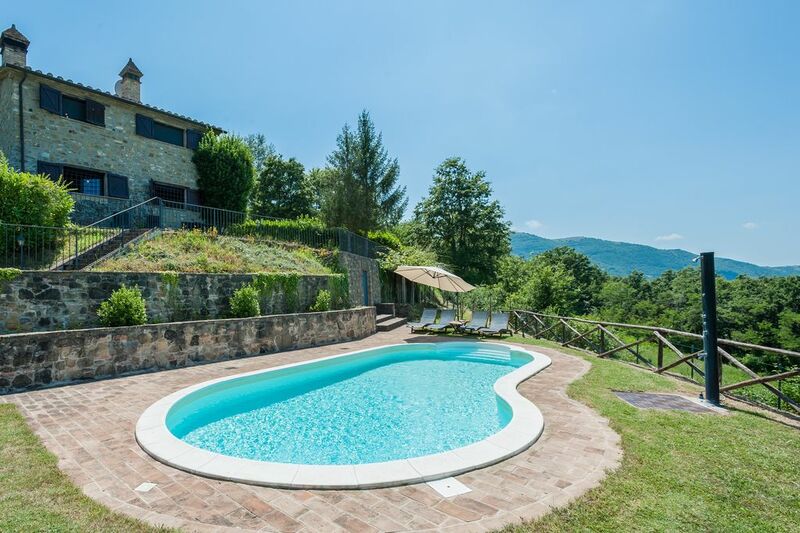 Detached villa with a private swimming pool (The pool can be used from 27/5-30/9), quietly set in the hills at 7 km from Umbertide. The cottage is made out of natural stones with the original wooden beams preserved on the inside. The garden offers a great view over the green, hilly countryside. Living room with double sofa bed. Children's bed on request (additional charge). We had a very relaxing and enjoyable stay at the house. It is beautifully located on top of the hill and had everything we needed to relax. The bathroom and kitchen are modern and well equipped. The pool and cabana were perfect for enjoying the views and weather. The property is well located to visit the sites of Umbria - we also drive to Florence one day which was under 2 hours, so can trace resound central Italy easily. "A beautiful, hill-top villa with a splendid pool with good access to some key Umbrian and Tuscan towns. The garden (and the food you can get from it! )and the generosity of the owning family is a great feature of this property." Esperienza bellissima in un posto incantevole. Proprietari sempre disponibili e molto discreti. Da ripetere. Sia i miei figli che la nostra cucciola si sono trovati a loro agio da subito. La casa è ben tenuta è molto pulita come del resto anche il giardino e la piscina. Un ringraziamento particolare al babbo di Daniela. Wir, eine 4-köpfige Familie, durften im August 2018 für 14 Tage das Haus mieten. Es war wunderschön!!! Das Haus ist typisch italienisch rustikal, mit Steinen und Holzbalken aufgebaut. Draussen warm, innen angnehm kühl. Die Einrichtung ist sehr schön und modern. Man hat alles was man braucht. Der Ausblick ist unbeschreiblich, das muss man gesehen haben. Der Garten ist ebenfalls sehr gepflegt und sehr schön. Man kann dort Tomaten, Gurken, Basilikum etc. selbst ernten. Sehr leckere Sachen. Weiterhin ein kleines Highlight ist der wunderbare grosse Pool. Sehr sehr schön im Sommer bei 30 Grad plus. Die Familie ist sehr nett, Papa Adriano hat sich um alles gekümmert und täglich den Pool gesäubert. Die Entfernung zu Städten wir Rom (2h) Siena (1,5h) San Marino (2h) ist akzeptabel. Für Ausflüge alles gut erreichbar. Von uns aus ist dieses Haus unbedingt zu empfehlen. Wir haben uns sehr wohl gefühlt und wollten garnicht mehr nach Hause. Maison idéale pour séjourner en Ombrie: confortable, très bien située pour visiter la région, jouissant d'une vue magnifique et d'un cadre enchanteur. La piscine est très agréable. Quant aux propriétaires ils sont d'une grande gentillesse et présents au moindre problème. Grand merci à eux pour leur accueil et leur disponibilité! Tipica casetta umbra, con stupenda piscina privata! Proprietari molto gentili e sempre disponibili! (Text automatically translated) Relaxing holidays in the heart of Italy ... Easily accessible sea and the main Italian cities.